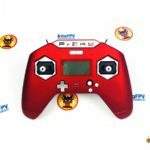 We have been very excited about the release of the Frsky X-Lite, a gamepad style RC transmitter, however we also learned that the X-lite is unlikely to be compatible with the TBS Crossfire external module, which is a huge disappointment to some users. Don’t worry! The Dark Knight Nirvana TX from UndergroundFPV might be a good alternative.